Let’s take a few real life scenarios. 1. If you’re doing Whole30 and you eat a Thin Mint with nobody around, does it count as “cheating”? 2. If you put your jog bra on intending to go on a run by yourself, but you end up sitting on your porch drinking coffee, does it count as a workout? 3. If you go to the gym but spend most of your time walking around and scrolling through your song list looking for the perfect song to accompany jump squats, can you check off your HIIT workout on your plan? 4. If you hit every sample table at Costco, do you account for that in your calorie or macro count? It just comes down to being honest with yourself about your actions. You know, deep down, when you’re putting forth the focus and effort you need to get to your goals. I spend a lot of time by myself, so I struggle with accountability. It’s one of the reasons I hired my own fitness coach (the amazing Jenna Damron of Devoted Fitness Coaching) to write my workout plans. If I fall out of touch, I start to hear Facebook Messenger dinging. She checks up on me a lot, and I love that. Accountability was also the reason I liked Weight Watchers so much back in the day. I knew that each week I’d be stepping on that scale, and I had nobody to point fingers at besides myself if I didn’t like that week’s number. It was also one of the reasons I liked marathon training. If I planned, trained, and was responsible about recovering properly and getting enough sleep, the odds were good that I’d cross the finish line standing tall. I was responsible for how I felt at the end of each race because of how seriously I took my training. I never had a coach, but I was pretty obsessive about staying true to my training plans. So if you raised a glass on New Year’s and announced that 2017 was the year you would lose the weight, run the marathon, get chiseled arms, or be able to walk up the stairs without getting winded, start tracking your progress, or recruit a workout buddy to keep you accountable. Here’s what I recommend. Keep a journal, both for exercise and nutrition. The amount of detail is up to you–please understand I am not advocating for obsessive detail here, just basic notes to refer back to–but you may find it useful when something goes awry. When you wonder why your pants are tight and you look back over the past few weeks and notice that you ate more peanut butter than you realized, you may decide to change that habit. If you wonder why you’re not getting faster and you look back at your training journal (or Garmin data) and realize you haven’t changed your pace or done any tempo runs, you have your answer. It’s a cliche, but knowledge is power. There are so many amazing tools out there now to help you stay accountable, so I encourage you to find one that feels right for you. For me, it’s inputting my nutrition into MyFitnessPal and writing down the weights I use for each workout. It’s like how I used to keep an old bridesmaid dress in my closet, long after I’d lost a lot of weight. There were days when I’d feel bloated, or would look in the mirror and would start picking myself apart. But putting on that dress–which was way too big on me after I’d lost the weight–reminded me how far I’d come. 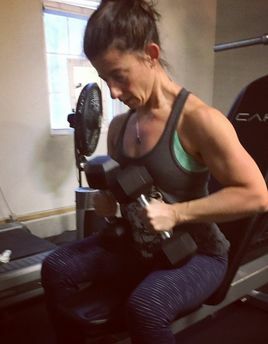 When one of my clients finishes a 12-session package, I like to tell her how far she’s come with weights from the beginning. It’s awesome to see her face she realizes how much she’s added to each of her lifts. She walks out of the gym with her head held high and a swagger in her step. If you ever need someone to keep you accountable, my virtual door is always open. Just be ready to hear some dings on your phone. I know you’re secretly competitive. Now stop being so secretive about it. If some is good, more is better . . . right? I finally tried CrossFit. Here’s what happened.